Most parents at least attempt to watch their language around young children, recognizing that if they say it, soon enough so will their little one. And while the stories are funny in retrospect, at the time they can be mortifying for the parent and sometimes end up in a problem that needs to be addressed. So as a result, most parents do try to “watch their mouth” at least when it comes to “bad words”. But what about words (and actions) that aren’t always considered “bad”? What about all the things that we say and do in front of little kids that aren’t frowned upon by preschool teachers the way swears and words like “shut-up” are. What about words like “fat”, “ugly”, and “gross”. You won’t get a call home from Jenny’s daycare if she calls something “gross” or “ugly” they way you would if she happened to drop the “S-word.” So, if preschool teachers aren’t calling home, does that mean parents shouldn’t’ worry? Nope, sorry Mom and Dad, there are a whole lot of things you have to be both careful about saying and doing in front of your little ones because they are always watching. As a someone who studies the effects of media on young children, it amazes me how many rules parents have in place to restrict what their children are watching and seeing either on the TV, Internet, video games, or whatever, but rarely do you hear parents talk about their rules about how they personally act and behave in front of their children. In my house growing up, “shut up” was a “swear word.” I have yet to meet a parent that has declared “fat”, “gross”, or “ugly unspeakable terms at home. Similarly, there are rules about certain behaviors in homes, like “no kicking”, “no hitting”, and “no running” but rules about grabbing your belly fat and making a disgusted face or refusing to eat dinner because of a diet are yet to be outlawed in most homes. Now, I’m not denying the effects of seeing an image of an airbrushed model in a magazine or on TV 20 times a day. Certainly, that has negative impacts on body image (for kids and adults alike). And I’m not suggesting that homes should become rule-bound prison camps where discussion of exercise and health shouldn’t happen. I’m just suggesting that as parents and caregivers we take note of the other “bad” behaviors and words that we are modeling for our children. There was a great public awareness campaign in England about this issue of kids always watching. Watch the video here but note that it is pretty intense and it’s a video for parents, not kids. While this video is extreme, it does demonstrate that young children are always watching and learning from you and from others. If young children hear their mother constantly saying “I look so ugly” or their aunt staring at herself in the mirror sucking her stomach or their father complaining about being fat, they will copy the words and the behaviors in the same way they will repeat a mistakenly said “bad word”. 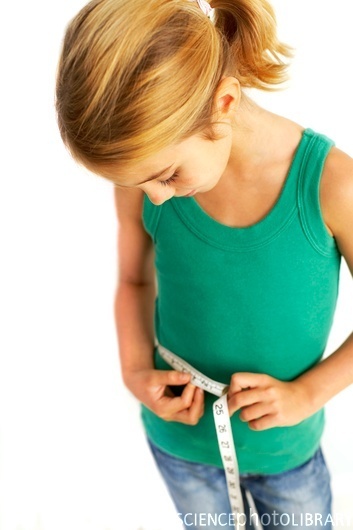 Body image concerns start in early childhood and effects both boys and girls. Note, while most of the research focuses on moms and daughters, please recognize that this is an issues for fathers and sons as well. Family Anatomy Body Image, Part 1: How kids can learn to like their looks. Provides statistics from reports in the Journal of Health Psychology and the National Association of Anorexia Nervosa and Associated Eating Disorders. Abigail Natenshon is a psychotherapist who specializes in treatment of eating disorders. She wrote a great article on her website Empowered Parents about Body Image Concerns in Young Children. Dr. Robyn Silverman provides a condensed version of the research on young children and body image on her website. WomensHealth.gov has additional information about body image and young children and includes tips for how to help your child develop a positive body image.